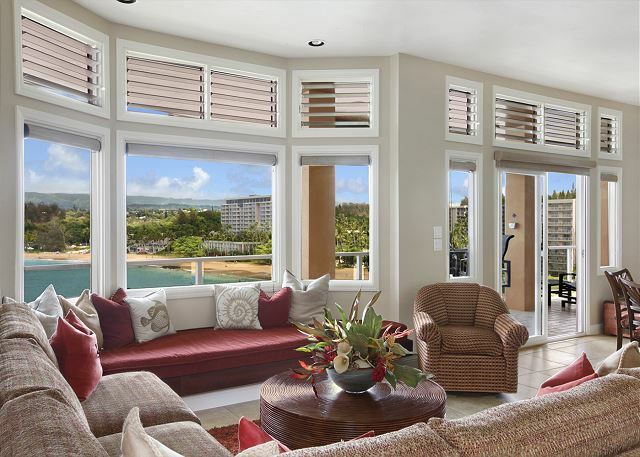 With breathtaking vistas of one of Kauai’s most active bays, revel in the majestic scenery of paradise from your private and pristine, seaside perch. Watch cruise ships sail into the harbor, whales spout and breech in the distance, dolphins play in the waves and surfers ride the swell. 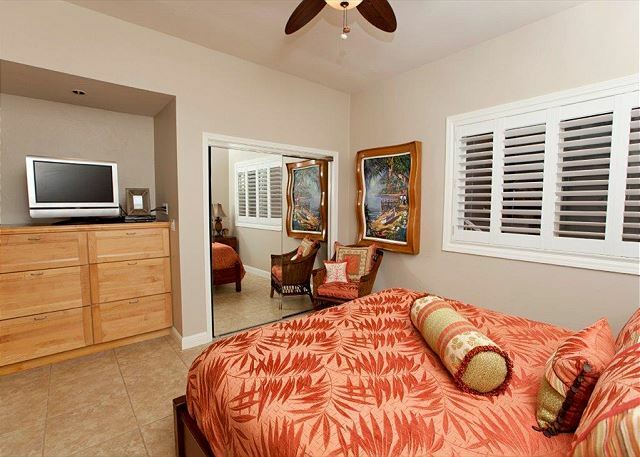 Tastefully furnished with traditional Hawaiian motif and hardwood accents, this stately suite offers quality on all levels. 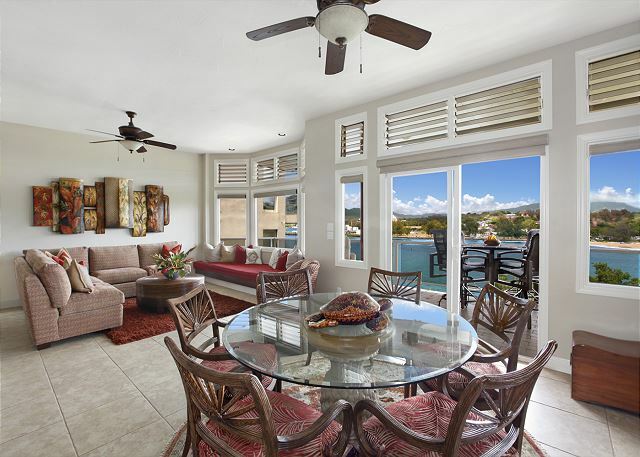 Two bedrooms, two baths, a full gourmet kitchen, a large living area with two bay windows and an unbeatable balcony setup provide plenty of space to comfortably accommodate four people. - Special access and unlimited use of the adjacent Marriott's Beach Club, Health Club, Pool, Fitness, & Tennis Facility. 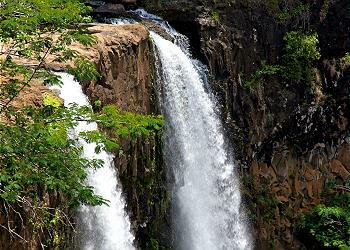 - Nearby miles of scenic walking paths, Duke’s Canoe Club restaurant and Kalapaki Bay itself. This place is even better than the photos. 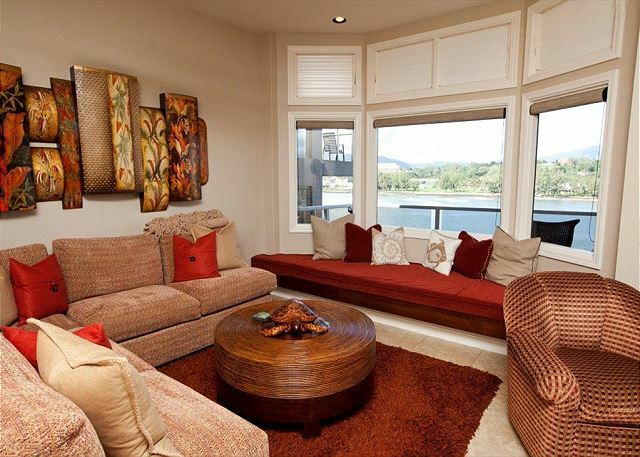 It is clean and comfortable with a fabulous view of the bay. We loved sitting on the patio watching the surfers every day. The elevator to the beach was not in service but wasn't a problem for us. We didn't mind the walk to the marriott property. We also appreciated the discounted golf at nearby Timbers. We will return. From the booking to our checkout was all smooth. We loved the view the best. Plenty of space in this condo and our view was amazing. Best part was the using the nearby Marriott amenities while having the convenience of a kitchen and whole condo to ourselves. The bbq gas tank was not full. We reached out and it was replaced next day. Nice townhome, great view, sheltered beach. Great vacation but the elevator was not working. Upon arrival we were absolutely blown away by the luxuriousness and beauty of the rental property, the surrounding areas and the view. We had seen photos prior to coming, but nothing compared to walking in for the first time. Our entire stay was 5 Stars and top notch in every facet. Have not stayed at a nicer or more suitable place in all my years coming to the islands. Definitely looking forward to coming back again soon. Already miss having breakfast on the balcony and watching the surfers early in the morning. I have absolutely zero complaints or suggestions on how to make this rental more attractive to vacationers and people travelling to the Garden Island. Mahalo!!! The condo was just as described in the ad and reflected all the previous positive reviews. 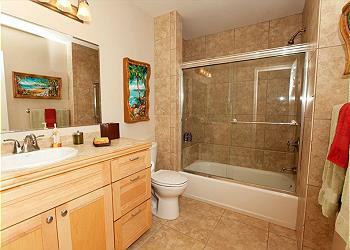 It was nicely furnished, super clean, has updated baths, and a well equipped kitchen. Beds were very comfortable and the AC worked well. Access to the Marriott facilities is a nice plus. We’d stay here again and are planning to do so next year. Excellent Property - couldn't ask for anything more! My husband, mother, and I spent 2 weeks at this wonderful condo in March. The property is as lovely as shown in the pictures. The furnishings are high quality and comfortable. The kitchen is well stocked with pots, pans, plates, glassware - - plus a fair amount of spices, olive oil, coffee filters (which is really nice so that you don't have to buy every little thing - they are probably just from previous guests, but we really appreciated that they were left for others to use). We took advantage of the grill three nights - it worked well. We enjoyed the large balcony every morning and every evening. It was so peaceful to watch the ocean and the surfers. Lots of nice chairs outside to enjoy the view. The whole rental experience was very laid back. By that I mean, it was easy to ask questions, easy to book, the property was thoughtfully appointed in a way to make guests comfortable in their home away from home. We also appreciated that there weren't notes everywhere telling us what we can and cannot do! We've stayed at homes where every room had a tape note - Do THIS, Do NOT do THAT.... it was really off-putting. 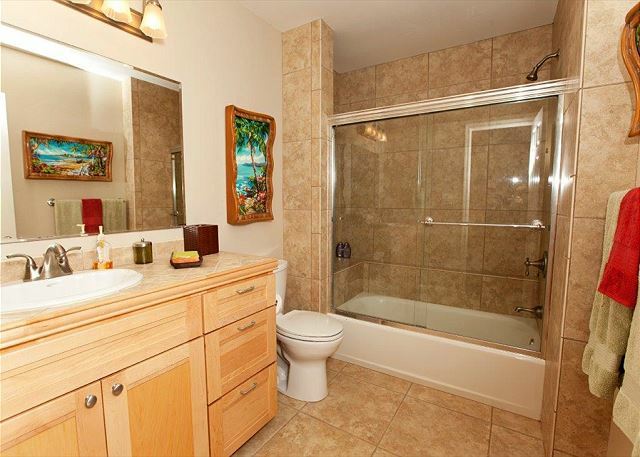 This condo was just completely comfortable from start to finish. We also really liked having access to the Marriott property. My mother has difficulty walking so she called for a Marriott shuttle each day to pick her up and bring her down to the Marriott with access to nearby restaurants. Luckily the shuttle would pick her up because the elevator down to the Marriott was broken 2 separate times with the second time being for the last 4-5 days of our stay. Kauai Exclusive was an excellent property management company to work with. They were extremely responsive, friendly, informative. I had a few minor things that I contacted them with and they always responded within 1-2 hours. They also reached out to the Marriott regarding the elevator being broken. We were very impressed with Kauai Exclusive. Stunning views of the Kalapaki bay and beach. Surf was up and we saw lots of surfers, body surfers, etc. We had a really good stay and enjoyed the unit and included amenities at Marriott. We enjoyed our 10nt. stay in this great condo. 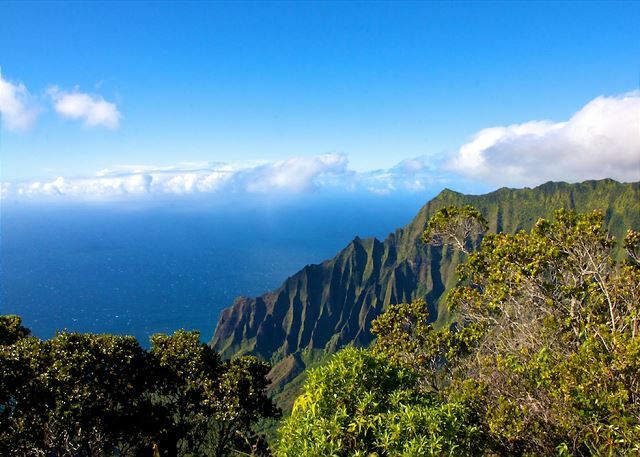 It had everything you needed including a view of Kalapaki Bay & use of the Marriott, which was included, a short walk away. You can even walk to the beautiful golf course. Perfect location to explore the Island. The management company was there for any of your needs. 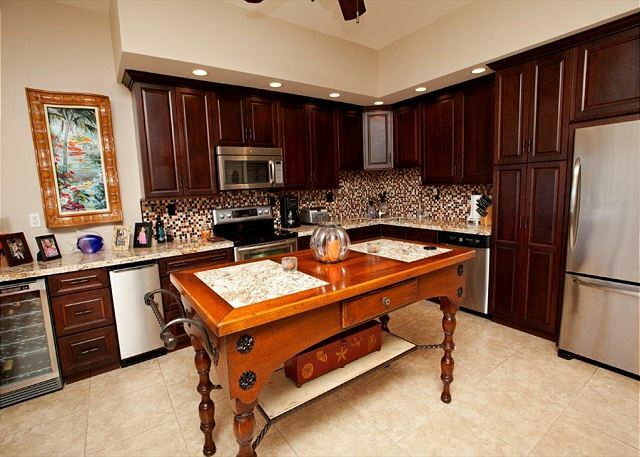 Very nice condo with well stocked kitchen. Beautiful view from the lanai of Kalapaki Beach, Nawiliwili Bay, and the mountains to the west. Includes privileges at the beautiful Marriott Vacation Club pool where we spent a lot of time. Highly recommended. Lovely condo with a great view and access to all the Marriott amenities. It was our second stay here and definitely won’t be our last! 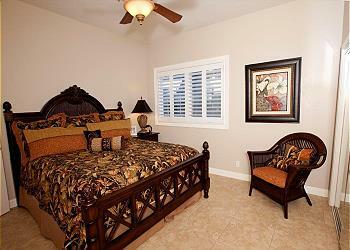 A wonderful vacation rental! Very clean with everything we could ever need. Rental was furnished beautifully. Beautiful patio overlooking the beach to watch surfing. . Great having access to the Marriott pool and gym that was a short walk with an elevator. Would highly recommend this property to anyone . It is in a quiet location. Our party of 4 loved everything about this property! 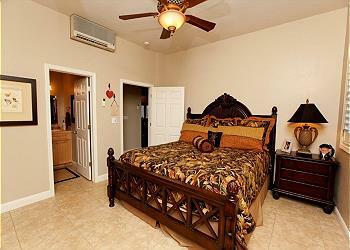 The house is extremely gorgeous, comfortable, and accommodating. Everything was clean and well maintained. We were very sad to leave. Would definitely stay here again! We were absolutely in love with this home. The quality of the furnishings, the kitchen supplies, the outdoor table and chairs were top notch. Can't wait to come back! We had a great time, enjoyed all that the house had to offer. Great views, great location! Will be back soon. Beyond expectations. Our family and guest had 12 rooms at the Marriott a condo across the bay and 3 homes on the cliff, all with different leasing companies. Our home was by far the nicest, it met all our need and more. The staff at K.E.M was exceptional. LOVED IT. Location was great, access to the Marriott facilities was a wonderful perk, and the property was immaculate. The only item I could pick on is that the t-stat for the AC in the master bedroom wasn't accurate so the AC kept going, but that didn't affect our experience there. This won't be the last time my family will stay here. I will consider this property for every future trip to Kauai. I just hope this review doesn't limit the availability on this great property (just kidding...not really). Awesome! Upscale Accommodations with full Amanites. 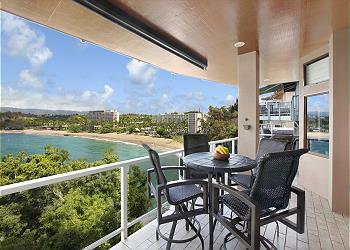 Lovely Ocean Front with Great Ocean Views and a very large balcony. They offered a Big discount on golf next door too. My family (spouse and two girls ages 9 and 11) absolutely loved this rental! The location was very convenient as we enjoyed the short drive to and from the airport and we visited the south part of the island regularly with no problems. The house is spacious and felt like home. Everything is well stocked and we felt comfortable from the moment we walked through the door. We appreciated all of the amenities and would return at any time. Two big thumbs up! 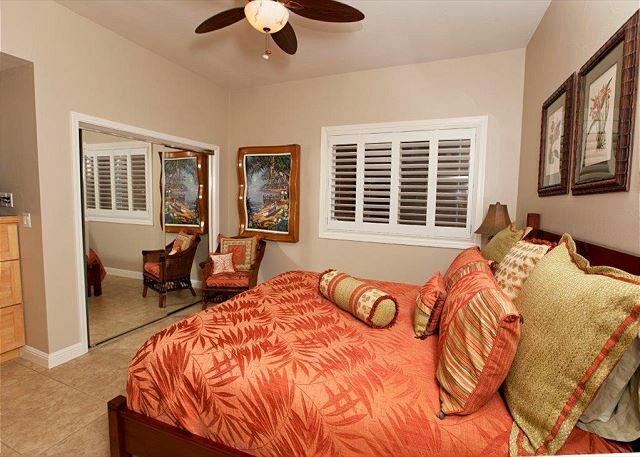 This property has a beautiful location with easy access to the Marriott amenities. 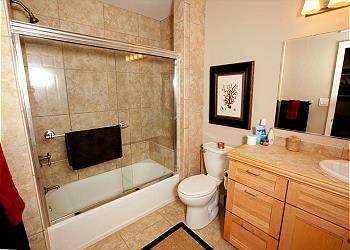 The condo was very clean on our arrival and our concierge kept in contact with us prior to and at our arrival. We ended up not needing his services but it was a nice option. Parking was easy and always available. The kitchen had everything a family could need and more. We highly recommend this condo and would stay here again if in the area. Great condo with an amazing setting! 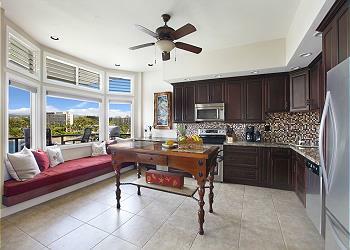 We've stayed in several condos in Hawaii and around the world and found this one to be right at the top of the list. Everything you could possibly need was already on site. There was also unopened food and drinks left from the previous guests, which was nice (and we added to that!). The beds were comfortable and the use of the Marriott facilities was an added bonus. Overall our stay was excellent and we will be staying there again. We have been to Kauai no less than 20 times in 20 years. This vacation was BY FAR been the best and it was due in large part to this amazing, wonderful house. From the moment we walked in, it felt like home, but with all the extra bells and whistles. The photos don't do it justice. We arrived a little early and saw that the cleaning crew was scrubbing it down, changing even the bath mats. We went to Costco just a few minutes away to get some groceries for the week. The kitchen is stocked with every utensil and appliance you'd want to purchase but never do. The separate ice maker kept our HyrdoFlasks cool all day long! The full sized fridge allowed us to stock up for the week. The couches are comfortable with ample room for everyone. The bay windows are like those out of a movie. Many great conversations and memories were left in those windows. My daughters will always cherish those moments.Each bedroom has an en suite bath, both stocked with toiletries welcoming us. The styling of the home is classy, but not stuffy, allowing us to truly enjoy the island feeling. 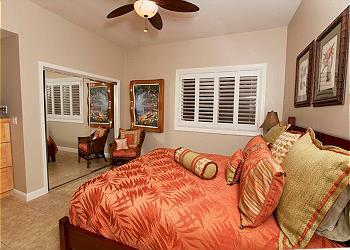 The AC, a HARD find in homes on Kauai, was a true gift and we respected the use of it to nighttime. We stayed at the home through Fourth of July and were able to get a fantastic view of the fireworks display from the stadium. Did I mention the balcony has lots of seating AND a gas grill?! The balcony has an incredible view of the harbor and beachfront. We had access to the Marriott pool and amenities and everyone was so kind. The beach/pool are just a few minutes walk away, with a private elevator (yes, an elevator!) ride down to the walkway on the Marriott property. We cannot wait to return and were genuinely sad to leave this fantastic home away from home behind. Location was best we stayed so far. We enjoyed the Marriott pool, gym, restaurants, and shops all a few steps away. View was spectacular when reclining to private accommodations. High speed internet, Cable TV, Air condition, with home style environment. Perfect get away location. Wow! Our party of four absolutely LOVED this house. Besides the fact that the house is beautifully appointed and perfectly located, it is extremely comfortable and accommodating! We enjoyed our time spent there almost as much as our sightseeing on the island!! We loved returning each evening to this lovely home, sitting out on the balcony, and inhaling the gorgeous views. Five stars, for sure! We stayed for 6 nights and were thrilled by the unit. It was perfect for two couples. 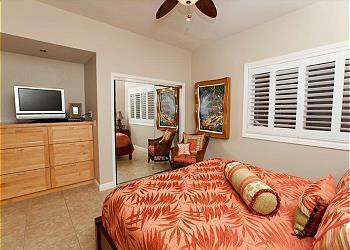 The location was very convenient to the Marriott (a 5 minute walk), the shopping & restaurants, and Lihue. The owners have obviously tried to keep the place lovely with comfortable, clean furniture and amenities, with kitchen utensils, and comfortable beds. I own a vacation rental in Southern California so I know how challenging it is to maintain a property, I give a big "high five" for their efforts. A word of advice to prospective renters: if you cannot walk up or down stairs, this is the wrong unit for you, or if you must carry a stroller up those stairs. We did fine, but there are many who could not. And a request to the owners: another hairdryer. We only had one and it presented challenges in the mornings. But those are two small difficulties. I would give this property a BIG A+++. And the view, I haven't mentioned the view! We thoroughly enjoyed sitting on the very comfortable lanai every morning & evening just observing the beach, the water, the colorful sky, and the rainbows. Thrilling! We spent a week in this amazing condo. It was as beautiful as the photos show and the amenities were top notch. The condo supplies, including basic cooking oils and spices, kitchen wraps (plastic, foil & storage bags! ), kitchenware, cookware & supplies were top notch, lots provided including cleaning supplies;so helpful in making our stay comfortable. Liked the privacy, peace and quiet! It was amazing! High quality throughout and especially liked the condo finishes and furnishings. This location is amazing, fabulous views, sunsets, and a short walk down the sidewalk to the Marriott elevator and the beach! So quick and easy. The bay is wonderful for swimming at any time. Had some blustery winter days but this was protected. Gear for water sports, SUP, outrigger canoes & learning to surf available on beach. Lots of restaurants and shops walking distance. 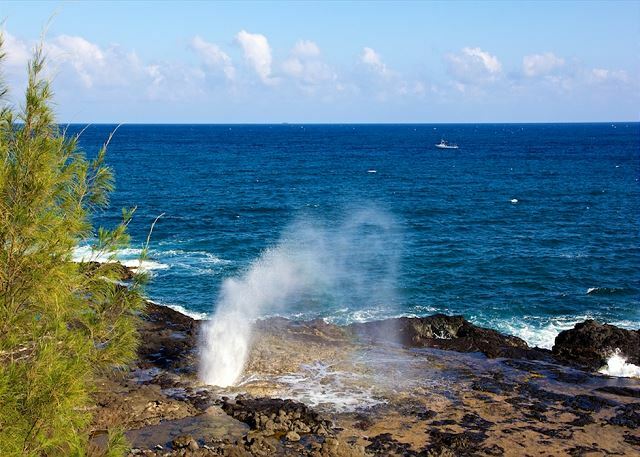 Good central location to explore Kauai.Snorkeling down in shallows below lanaii--lots of fish, and a shy turtle!Loved Kauai Mountain Tubing, kayaking Wailua River, biking shoreline path East Kauai, and Catamaran Na Pali/Whale watching/snorkeling. Have recommended this condo and this mgmt co. to all friends and acquaintances. If you have a need they respond right away, often within hours! THANKS to the Owners of this amazing condo and to their mgmt co., Kauai Exclusive. Look forward to returning! Our week stay at Kalapaki Beach front was more than expected. The condo was equipped with everything we needed. Having two bedrooms each having its own king size bed and each bedroom having its own bathroom made this condo perfect for our family. 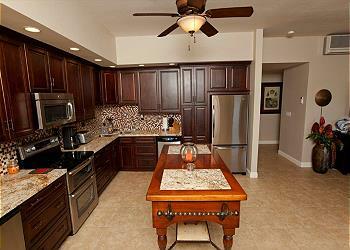 The kitchen is spacious making it easy for 4 people to move around. Beautiful covered lanai that we used multiple times a day. Also being able to use the Marriott beach and pools was an added bonus. Great central location to all attractions and airport. I would recommend this paradise condo to anyone. We had a great time and plan to come back. This unit couldn't be better! Excellent layout with incredible design, fantastic patio with a spectacular view, and only minutes to the beach at the Marriott! Which, by the way, you have full access to similar to a hotel guest! I would highly recommend this rental.